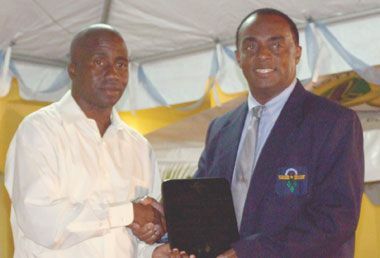 Thomas, a teacher at the C W Prescod Primary School, not only walked away with the Spots Journalist award for the fourth straight year, but was also named the Chairmanâs Choice for his prestigious award, at the ceremony which took place on Saturday, March 12, at the Arnos Vale Playing Field. Chairman of the National Sports Council Carlton âTeddyâ James, speaking to SEARCHLIGHT, said that his decision to select Thomas for this award was based on the fact that he sees discipline and commitment in the work and attitude of the writer, a resident of the Sion Hill community. James said that he hopes the award would inspire Thomas to continue the work that he has been doing over the years, and motivate others to follow in Thomasâ footsteps, by doing their best at whatever sports related field that they may be involved. James, who has been chairman of the NSC for the past three years, said that it was not a tough decision to select Thomas as his choice. He said that Thomasâ ability to be frank and critical of even the organizations that he is affiliated to in his commentaries and columns mirrored his (James) own character. Thomas has been a sports reporter for the past 13 years, and is affiliated to a number of sports associations, teams and leagues in his community as well as nationally. Searchlight congratulates Thomas on his achievements.